Netanyahu: Israel Ready To Make Painful Concessions : The Two-Way The Israeli prime minister's speech came on the heels of the very public disagreement he has had with President Obama over returning to Israel's pre-1967 war borders. Netanyahu said Israel wants and needs peace but repeated his flat rejection of a return to what he called the "indefensible" borders. Vice President Joe Biden and House Speaker John Boehner watch as Israeli Prime Minister Benjamin Netanyahu addresses lawmakers at the Capitol on Tuesday. Many eyes were on Congress this morning as Israeli Prime Minister Benjamin Netanyahu addressed a joint meeting of the House and Senate. His speech came on the heels of the very public disagreement the Israeli leader has had with President Obama over whether Israel's pre-1967 war borders should be the basis (assuming there will also be mutually agreed-upon land swaps) for peace talks with the Palestinians. 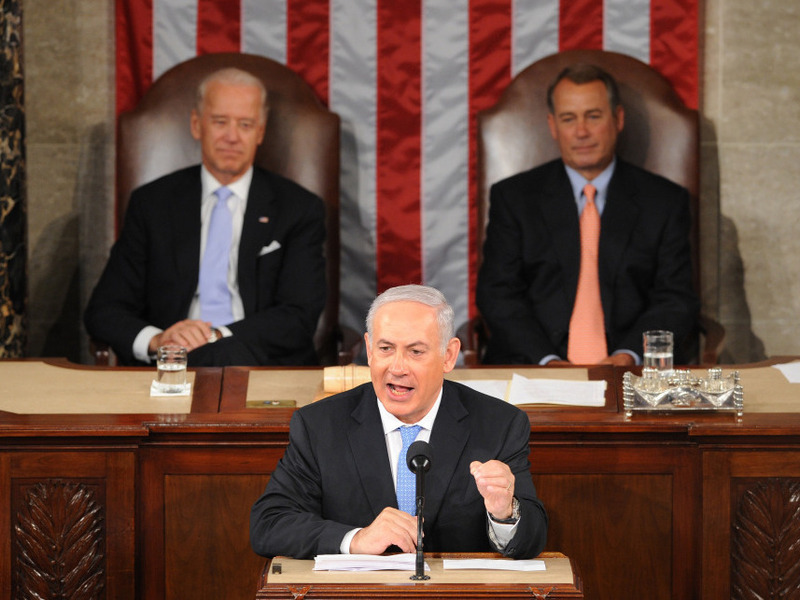 We updated this post with highlights from Netanyahu's address. Be sure to hit your "refresh" button to see our latest additions. In a line that will remind many of President Reagan's "Mr. Gorbachev, tear down this wall" quote, as he approaches the end of his address Netanyahu says to Palestinian President Mahmoud Abbas: "tear up your pact with Hamas. Sit down and negotiate. Make peace with the Jewish state." Turning to a bid by Palestinian leaders to get the U.N. to recognize a Palestinian state, Netanyahu says it must be "forcefully opposed" by those who want peace. "Peace cannot be imposed, it must be negotiated," he says. "Israel needs unique security arrangements because of its unique size," Netanyahu says. Turing to Vice President Biden, he says, "I'll grant you this. It's bigger than Delaware. It's even bigger than Rhode Island. But that's about it." That small size, he says, requires that any future Palestinian state be demilitarized. "As for Jerusalem, only a democratic Israel has protected the freedom of worship for all faiths in the city," Netanyahu says. "Jerusalem must never again be divided. Jerusalem must remain the united capital of Israel." "As President Obama said," Netanyahu continues, Israel's borders after any peace agreement "will be different" than they were before the 1967 war. With that reference, he's focusing on Obama's statement that the '67 borders — with mutually agreed upon land swaps — should be the basis of peace talks. If Palestinian leaders accept and endorse the right of Israel to exist, Netanyahu says, he will support significant compromises on Israel's part. Update at 11:55 a.m. ET. Why Hasn't There Been A Peace Pact? The reason a peace agreement hasn't been struck between Israel and the Palestinians, says Netanyahu, is that the other side is "unwilling to accept a Palestinian state if it meant accepting a Jewish state alongside it." It is time for Palestinian President Mahmoud Abbas to stand before his people and say "I will accept a Jewish state," Netanyahu says. Saying that the region is also the historical home for Palestinians, Netanyahu says he is committed to establishing a Palestinian state. "We must ... find a way to forge a lasting peace with the Palestinians," says Netanyahu, and that will mean "painful concessions" on Israel's part that include ceding some places that are part of the Jewish homelands. "We must take calls for our destruction seriously," Netanyahu says. "We are a nation that rose from the ashes of the Holocaust. When we say 'never again,' we mean 'never again!' "
And while "Israel always reserves the right to defend itself," he continues, "we'll never give up our quest for peace ... until we achieve it." "The more Iran believes that all options are on the table, the less the chance for confrontation," says Netanyahu. "In much of the international community calls for our destruction are met with utter silence," Netanyahu says. "Many rush to condemn Israel for defending itself. ... Not you. Not America." "Powerful forces" oppose freedom in the Middle East and Israel's existence, Netanyahu says, and "foremost among these forces is Iran." He warns that "time is running out. The hinge of history may soon turn. ... The greatest danger of all could soon be upon us: a militant Islamic regime armed with nuclear weapons." And Iran is working on missiles, Netanyahu says, that could deliver a nuclear weapon to Washington. Making the case that it's only in Israel where Arab citizens have democratic rights, Netanyahu declares that "Israel is not what is wrong about the Middle East, Israel is what is right about the Middle East." Referring to events in North Africa and the Mideast and the efforts by people there to promote democracy and reform, Netanyahu says that true freedom only comes when "governments permit protests in town squares ... and when human rights cannot be crushed by tribal loyalties or mob rule." Shortly before the disruption, Netanyahu thanked President Obama for his "steadfast commitment to Israel's security." There was just a brief disruption when someone started shouting from the gallery. Lawmakers quickly drowned out the protester. And Netanyahu said "this is real democracy," to more cheers. To a rousing ovation, Netanyahu says "congratulations Mr. President, you got bin Laden! Good riddance!" "Israel has no better friend than America and America has no better friend than Israel!" Netanyahu declares. Referring to Vice President Biden, Netanyahu asks "Mr. Vice President do you remember the time when we were the new kids in town?" Biden laughed and did the sign of the cross. Update at 11:22 a.m. ET: Netanyahu is about to speak.